Customers of smartphone taxi app Uber will soon be able to stream music from Spotify during rides, after the two companies announced a partnership. People will be able to link their Spotify and Uber accounts, then access their playlists from Spotify’s iOS and Android apps during Uber rides with drivers that have opted in to the feature. “Uber users who link their Spotify account to their Uber account can basically push a button and get a ride, and get into the car, and in the car their Spotify music, their Spotify station is playing,” said Travis Kalanick, Uber’s chief executive, during a conference call with journalists to announced the partnership. Initially, the feature will be available in 10 cities: London, Los Angeles, Mexico City, Nashville, New York, San Francisco, Singapore, Stockholm, Sydney and Toronto, although Kalanick stressed that the new feature will be optional for drivers. Spotify and Uber are holding launch parties on Friday 21 November in those cities, featuring artists including Andrew WK, Professor Green and Diplo. Kalanick shared the call with Spotify chief executive Daniel Ek, describing him as “a fellow entrepreneur and a good friend”, before Ek talked about cars as Spotify’s third key device category, alongside mobile devices – smartphones and tablets – and computers. “One of the big things for us is how do we get into the car. Given that people’s average commute time is 30 minutes to an hour, how do we get into that space and allow people to play their music?” said Ek. Spotify and Uber’s promotional video for their partnership. 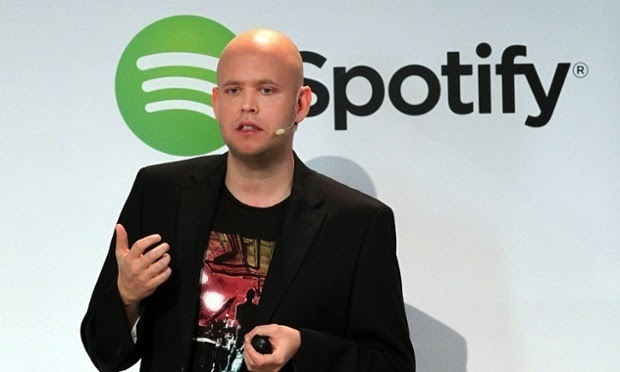 Both Kalanick and Ek declined to discuss whether the partnership involves one or both taking a share of the other’s revenues, although Ek suggested that the deal will help Spotify, which currently has 50 million active users, appeal to a younger audience. “The world is moving to having cars available on demand to you wherever you are, when you’re travelling. And Spotify is having your music on demand, whatever device you’re on,” he said. News of the partnership had leaked out over the weekend, after Uber sent invitations to journalists promising “a first-of-its-kind partnership”, complete with an illustration of musical notes. Technology site TechCrunch was first to pinpoint the partner as Spotify, with leaked screenshots of the integration of the latter’s service in Uber’s smartphone app. Spotify has been enduring a rocky few days, after Taylor Swift pulled her albums from the service and accused it of not fairly compensating artists and songwriters for streams of their work. “I’m not willing to contribute my life’s work to an experiment that I don’t feel fairly compensates the writers, producers, artists and creators of this music,” she told Yahoo in an interview. Uber has faced its own controversies in recent months, including allegations of anorganised effort to poach drivers from rival Lyft, demonstrations against the company by taxi drivers in several European cities, and deactivating one driver’s account after he was uncomplimentary about the company on social media. Both companies will be hoping the partnership helps their growth, as well as their valuations. Spotify’s last funding round in November 2013 valued the company at $4bn, although that has likely increased since. But even that pales next to Uber, with its most recent valuation of $18bn. Business Insider claimed this week that Uber’s annual gross revenues areexpected to reach a run-rate of $10bn by the end of 2015 – so around $833m a month by the end of the year, if not $10bn for the 12 months to that point – with the company paying 80% of that back out to drivers.